The pressure on wages and the needs of the business to control costs sees many HR teams struggle when it comes to effectively dealing with demands for fast-growing wage increases. What can you do to prepare and respond when staff start asking for a raise? After years of austerity, companies are seeing workers across many industries requesting real-world increases in wages. This comes at a time when there are more jobs and not enough people to fill them, tipping the balance in the favor of employees. Pay is one of the most emotive subjects in any business, and varying personal or business targets, metrics and objectives across companies or departments can make the issue highly competitive. From their perspective, workers see record financial performances, booming stock markets and other indicators as a sign that businesses are cash rich, and are looking for their share. They are also able to more easily find out about competitive pay, local salaries and other indicators from online sources, helping to set out their case. Therefore, it will come as no surprise to many HR practitioners that there are a growing number of requests for increased monetary compensation. As job markets are more flexible, workers are not taking no for an answer; they are more prepared to move to a better paid role, or push for additional perks like further education, bonuses, or other benefits. While smaller companies can offer greater flexibility compared to the limitations of a larger corporate structure, the greater opportunities in a big business help provide a different level of reward. As workers cross from both types of business, learn more about the remuneration landscape and expect a better deal, HR needs to be prepared to manage a growing number of requests while balancing the overall outlook of the company. With pay rises around the 3% mark in 2018, the first issue any business needs to manage is; does it have the capacity to increase pay? Most businesses set aside a percentage of revenue or profit for pay increases, and dealing with the issue in an ad-hoc fashion by the leadership means pay increases can be chaotic and disruptive, with the HR department pushing for formalization and structure. For the basic level of information required, HR needs to calculate the costs of pay rises for the individual and across a department or the company. These can be tied into performance ratings or other metrics, and need to be clearly defined and explained across the business to prevent people being treated unfairly, feeling undervalued or taking tribunal action if they feel they are being ignored. 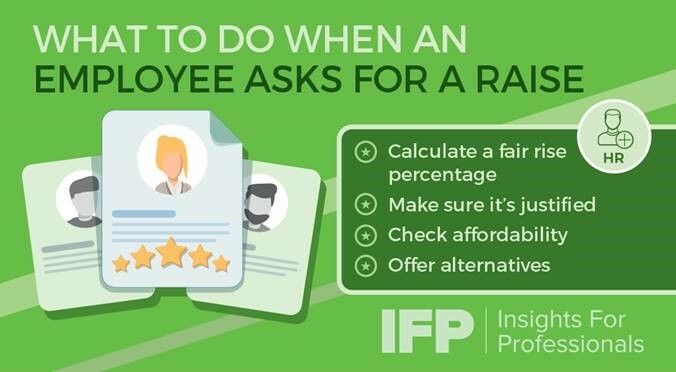 How should an employee ask for a raise? HR may be inundated with requests, and need to filter them carefully to establish which workers are within their rights for an increase and who might be trying it on. In a smaller company, it is easier to know who really delivers, but in larger organizations, HR is often more reliant on metrics and reports. To make the process clearer, HR needs a formal method for employees to apply for a raise, either as part of the annual review process, or through a specific form that lets the business set the agenda. This also prevents workers trying to sneak a pay rise out of their immediate boss, without wider discussion. Having a consistent form with the same fields to fill out enables workers to demonstrate proof that they helped win business or save money in hard cash amounts. Fields like “How would you change your job to be more efficient?” and “What strengths have you demonstrated this year?” help workers to demonstrate leadership, insight or help them remember about delivering on projects on time and on budget. Not everyone in the businesses’ pay increase decision-making process may be aware of a worker’s role, so they need to be clearly highlighted. Encouraging people to highlight softer skills such as “good team player,” or “works plenty of extra hours” are less impactful when appealing for a raise, but can be considered by HR as part of a drive for a promotion. Getting feedback on workers, perhaps using the much-vaunted 360-degree feedback technique will help HR establish who is worth the raise. Other techniques such as personal interviews and checking people analytics data will also help find those worthy of a pay rise. Then suggested increases can be forwarded to the department or business leaders to help make final decisions. From the company perspective, all such requests should be treated fairly and confidentially. A digital or paper trail needs to be kept as evidence all requests are handled correctly, and to help prove there is no bias. If a raise is not possible, or cannot be fully funded, then other benefits can be considered, such as the offer to work from home or work flexible hours can help. Other perks like healthcare, increased pension contributions and a company car are additional elements to consider. Think about providing feedback to workers on why those who got pay rises did so, and what those who didn’t need to do to get one next time. Be prepared for further discussions, and if the employee is vital to the company, then additional negotiations may be necessary. In any wage negotiation, both sides need to take a balanced perspective of what the employee’s skills are worth and what the business can afford. Making these clear to all workers is one way to avoid inflated hopes and unrealistic expectations. While individual increases are confidential, any business that keeps the whole process secretive and seems to favor one team or a select few employees over others will only foster upset and hurt that will damage the business overall.